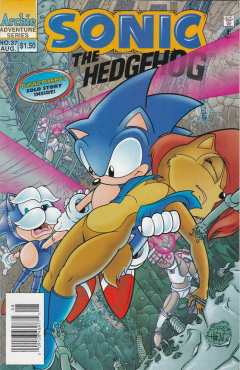 Sonic the Hedgehog 37 is the thirty-seventh issue of the Sonic the Hedgehog comic. This comic features two stories: "The Day Robotropolis Fell" and "Bunnie's Worst Nightmare". Sally Acorn and Sonic the Hedgehog are standing on a trash-heap in Robotropolis, awaiting the arrival of Uncle Chuck. Sonic sits down the pile, expecting them to wait a long time for the old hedgehog's arrival. Just as he gets comfortable, the junk pile becomes a door and opens, lifting and throwing Sonic into the air. Uncle Chuck pops out of the opening, unaware at first that he had opened the door on Sonic. He falls on the ground, as Uncle Chuck comes up to the surface, revealing to Sally his secret base of operations to spy on Robotnik. He leads them inside, where they go underground to a dug-out cavern full of electronics and surveillance equipment. Activating one of his surveillance systems, he shows Sonic and Sally a display showing rapidly moving lines. Sonic jokes that it is Uncle Chuck's heart-rate, making him wish it was, as the lines detect massive movement under Robotropolis...the calling signs of an earthquake. Although Sonic is pleased to hear about this, Uncle Chuck tells the two that Robotnik is already aware of the earthquake, preparing to hover over the city until the quake is over. Although Robotnik will be returning, Sally ponders up an idea to take advantage of his absence. Uncle Chuck notifies her that Robotropolis' defences will be down, allowing them to make a quick invasion. In a large warehouse, Robotnik and Snively prepare for their leave, boarding all SWATbots onto a large UFO-shaped vessel. As the last SWATbots board, Robotnik and Snively ascend the ramp to the vehicle. Snively asks Robotnik what will happen to the bots they left behind, but Robotnik turns a blind-eye to them, thinking of them as just machines. From outside Uncle Chuck's outpost, the three Freedom Fighters watch as Robotnik leaves the city on his vessel, all without saying goodbye. Uncle Chuck notes to Sally that the bots Robotnik had left behind are all roboticized Mobians. They run into Robotropolis, intent on deroboticizing their fellow citizens before the quake hits. Despite the risk of getting caught in the quake themselves, they continue on to save their friends. Sally is reluctant to go with Uncle Chuck, but she eventually decides to join the two on their journey, as they enter Robotnik's lair. Inside, they arrive at a large door, leading directly to the deroboticizer, but, as Robotnik had disabled everything in the city, they can't open it. They prepare to look around for some way to open the door, just as the ground shakes. The earthquake has begun! The earthquake stops abruptly, simply a tremor preluding the earthquake. Luckily for the group, the tremor opened a hole in the wall leading to the deroboticizer. They squeeze through and enter the room, while Uncle Chuck runs over to a console in the room. Sally hears a loud noise coming toward the room, as an alarm goes off. Uncle Chuck tells her it is alright, as he activated an alarm to have all bots left on Mobius to converge on the room. Sally and Sonic run over to Uncle Chuck, who is working on the deroboticizer, as another tremor occurs. With not much time left, Uncle Chuck plans to set off the deroboticizer in an explosion that will cause a blanket deroboticization effect, hitting all incoming bots. Sonic freaks out, but Uncle Chuck tells him and Sally to run, just as the bots arrive. The two take cover while Uncle Chuck holds the switch to the deroboticizer. Hordes of bots converge on the old hedgehog as he counts down. He hits the switch, causing a huge explosion that hits every bot in the area. Sonic and Sally look up, noticing the whole room covered in dust and smoke. He helps her up, calling out for Uncle Chuck. He is fine, coming out of the dust, but he is still roboticized. Still believing he is more of an asset as a robot, he decided to protect himself from the effects of the deroboticizer, intent on returning back to normal later on. On the other hand, the explosion worked, as every single bot in the room has been turned back into their own selves. They start to get up, confused, but the tremors start to become more frequent and strong. The three gather all the Mobians up and run out to evacuate the base. The exit Robotnik's headquarters, but the journey out of Robotropolis is a long one, and Sally doesn't think they can make it out in time. With perfect timing, Rotor arrives in Robotropolis with the Freedom Fighter's plane, landing in front of the base. They load all the Mobians up on the plane, but there isn't enough room for all of Sally, Sonic and Uncle Chuck. Although Uncle Chuck thinks he will be fine with his robotic body, Sally orders him to board the plane for his own safety. She and Sonic decide to stay behind and find their own way out. The plane takes off, leaving Sally and Sonic on their own, as the tremors start to destroy the city. Sally takes out NICOLE, intent on finding the fastest route out of Robotropolis. Sally stops for a moment, waiting as NICOLE processes the information she has to make a route. Sonic looks back to get Sally to move, noticing a large piece of debris falling over Sally. He runs back after her, but is too late, as the debris lands on part of Sally, knocking her out. He moves the debris out of the way and picks her up, just as NICOLE calculates the route. He picks NICOLE up, as it notifies him that they have a 12 percent of survival if they go and don't stop running. With Sally in tow, he runs off, as the earthquake gets worse. Despite all the falling debris, Sonic is able to easily manoeuvre over and around every obstacle that comes up. Looking ahead, he notices a chasm that's filling up with lava. He also sees a building about to fall over the chasm, that will prevent him from jumping over the chasm. Unable to stop and change paths to ensure his survival, per NICOLE's orders, he tries to come up with a plan fast. He notices a large hole on the side of the building that is falling, so he decides to take advantage of it. He jumps, entering the hole in the building, and jumps out of a hole on the other side, just as the building crashes into the chasm. He continues on, escaping Robotropolis with Sally with ease. The next day, with every Mobian in attendance, a bandaged-up Sally leads an award ceremony. She awards Uncle Chuck the Mobius Golden Acorn for his courage and selflessness. He jokes that she won't be able to pin the award on, though she made it specifically for him, with a magnet. Sonic, meanwhile, gives his award to NICOLE, who helped him and Sally escape the city. They all celebrate, while Uncle Chuck wonders what kind of welcome Robotnik is having. Witnessing his city in ruins, Robotnik returns aboard his vessel. He orders Snively to set the ship down so they can commence repairs immediately. Snively, however, is concerned that the Freedom Fighters will attack while they are rebuilding. Robotnik has already taken care of this, launching a satellite from the ship that will deploy a forcefield around the city. He asks him to activate the force field...so Snively does so preemptively. The forcefield activates and their ship hits it, causing them to crash to the ground below. An angry Robotnik gets up from the debris, telling him that he was going to say to activate it when they get inside the field. The Freedom Fighters are outside, enjoying a game of volleyball, while Bunnie Rabbot relaxes on a tree nearby. It is nearing the end of the day, so she calls on them to head back. While walking back to Knothole, Bunnie gets a bad itch near her robotic arm, thinking she sat in some poison ivy. At night, Bunnie runs after the others, calling for help. The area where she was itchy has started to become roboticized, making her think that the robotics in her arm are spreading. Rotor has no idea how this could've happened, but he decides to take a closer look, suspecting foul play on Robotnik's part. They all enter Rotor's lab, as she lays on an analysis table, while Rotor looks at some robotic samples from Bunnie. He notices that they have become self-replicating and autonomous, allowing them to grow on their own. Having no experience with this, Rotor tells Bunnie that he can do nothing. Bunnie has now become mostly roboticized, only her head remains intact, but with noticeable robotics. An emitter sprouts from one of her hands and activates, showing a holographic image of Robotnik. The message, an automated message from Robotnik, notifies Bunnie that she has entered the final stage of total roboticization. A microscopic device was implanted in her to ensure that she was eventually totally roboticized. Antoine wonders if it can be removed, but the message notifies her and him that the device is self-replicating. Even if she is deroboticized, the device will revert her back to a robotic state. The transmission ends. Sonic and Sally try to cheer up Bunnie, telling her that there has to be a way to revert her back to normal. She, however, believes that there is no way to roboticize her. She then notes that, perhaps, becoming a robot would be good, as she lifts up Rotor and Antoine with ease and in anger. She quickly puts them down, realizing what she had just done. The robotic side of her has started to fight for control, so they decide to get to work on helping her out before it is too late. That night, Bunnie, now completely roboticized but still in control of her consciousness, writes a letter to her friends. Not wanting to risk their lives, she decides to run off. She scampers out of her hut slowly and decides to run off before the others get up to prevent them from finding her. After running for quite some time, she starts to feel tired, despite her robotic state. She walks up to a tree and lays down, falling asleep right away. She wakes up during the morning, realizing she has slept for too long, and prepares to continue to run. She looks on the other side of the tree, as Sally arrives, asking her if she is okay. She tells Sally to stand back, but looks down to see that she has returned to normal. Sally is confused, leaving Bunnie to realize she just had a bad dream. Sally and Bunnie walk back to the volleyball game, leaving Bunnie a little anxious about what she experienced. This issue introduces the lettering of Luke Merlin. This is the first time a Bunnie Rabbot mini-story is told. As of this issue, most Mobians are now deroboticized. Uncle Chuck's hidden outpost in Robotropolis is shown. This aspect was adapted from SatAM, where Uncle Chuck set up an outpost in a pile of junk. Due to the great number of letters sent in for Sonic-Grams, this issue features a page devoted to names of those who sent in letters.